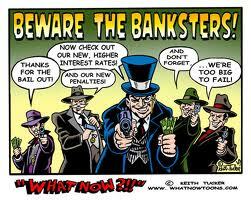 Banks, Financial Institutions and Corporations, Do they care about us? I have been pondering whether or not to write this post! As you know my posts are not by-on-large confrontational, they have no political bias and are generally talking about spirituality, joy, happiness, peace, the environment and all those good things in life, However, I am becoming more and more disgruntled, more unhappy with our world and in the way in which a) we are governed, b) by whom we are governed and c) the way in which we are treated by banks, financial institutions and corporations all around the world. I would like to share a short story with you, a true story, which came to me in the form of a letter I received on Saturday, a letter from my bank Nat West. (National Westminster Bank Plc, commonly known as NatWest, is the largest retail and commercial bank in the United Kingdom and has been part of The Royal Bank of Scotland Group since 2000. The Royal Bank of Scotland Group (RBS) is ranked among the top 10 largest banks in the world by assets. NatWest was established in 1968 by the merger of National Provincial Bank (established 1833 as National Provincial Bank of England) and Westminster Bank (established 1834 as London County and Westminster Bank). Source Wikipedia http://en.wikipedia.org/wiki/National_Westminster_Bank if you would like more information. The letter started off by stating that NatWest had decided they had recently taken the decision to discontinue providing banking services to customers who reside in certain overseas countries! And, that as their records indicate that I reside in China, so they are therefore notifying me that they will be closing my existing account(s). They also go on to say that ‘This is in no way intended to offend any customer, etc. etc. And I had just 60 days from the date of this letter to find alternative banking services and transfer my funds, establish new banking processes etc. !…Wow, I thought, I have been with this bank for 30 years, as both a personal customer and for many years a corporate business customer, I use it regularly, my children rely on it for me to send they money and although I live and work in China, I do have plans to return to the UK one day soon…So, I thought I would call the helpline as stated within the letter and after approximately 15 minutes on hold listening to poorly recorded music and continued messages thanking me for my patience, a lovely lady answered my call. I gave her the details in the letter and she replied, I’m sorry Sir, there is nothing we can do about it, the decision has been made!…….How can these banks make this sort of decision, especially when we have been loyal customers for 30 years, our feelings and plight did not come into their consideration or for that matter any concern for us and the troubles made to us because of ‘Their Decision’!…. Now, as I said at the beginning of this post, I am not confrontational and I do not as a rule speak out about this sort of wrong doing…But Hey, enough is enough, I have paid my fees and charges, as set by the bank each and every month, year in, year out with no thanks and not even a thanks for your business and loyalty Sir for the past 30 years of Banking with NatWest etc…. So, once again, the decision has been made, certainly not one in my best interest and I’m sure not in the best interests of others who are in the same boat as I. This decision has been made to save money…I mean make more money and yet just another bad decision made by the Bankers, ‘did I say that right?’…for their benefit only….They talk about ‘Brand Loyalty’..but what about ‘Customer Loyalty’? My Dear Friends, I would love to hear your thoughts on this matter and your stories…. It’s time for change, change in our favour…not just in favour of the elite, the rich, the corporations and the governments controlled by the former. A few words of I think sanity from Russell Brand “We can all contribute ideas as to how to change our world; schoolboys, squaddies, hippies, Muslims, Jews and if what I’m describing is naive then you can keep your education and your indoctrination because loving our planet and each other is a duty, a beautiful obligation. While chatting to people this week I heard some interesting ideas, here are a couple. We could use the money accumulated by those who have too much, not normal people with a couple of cars, giant corporations, to fund a fairer society. 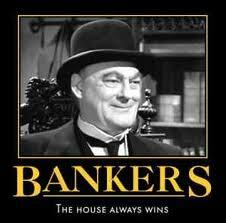 The US government gave a trillion dollars to bail out the big five banks over the past year. Banks that have grown by 30% since the crisis and are experiencing record profits and giving their execs record bonuses. How about, hang on to your hats because here comes a naïve suggestion, don’t give them that money, use it to create one million jobs at fifty grand a year for people who teach, nurse or protect. 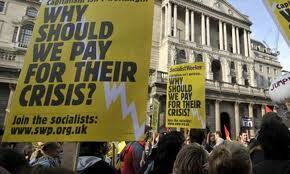 These bailouts for elites over services for the many are institutionalised within the system, no party proposes changing it. American people that voted, voted for it. I’m not voting for that. That’s one suggestion for the Americans; we started their country so we owe them a favour now things are getting heavy. Why don’t you try not paying taxes and see how quickly a lump of bird gets thrown in your face. It’s socialism for corporate elites and feudalism for the rest of us. Those suggestions did not come from me; The first came from Dave DeGraw, the second Johann Hari got from UK Uncut. Luckily with organisations like them, Occupy, Anonymous and The People’s Assembly I don’t need to come with ideas, we can all participate. I’m happy to be a part of the conversation, if more young people are talking about fracking instead of twerking we’re heading in the right direction. The people that govern us don’t want an active population who are politically engaged, they want passive consumers distracted by the spectacle of which I accept I am a part. Well said Russell, I’d vote for that too! I’d vote for that, too. Great post. Peace . . . Exactly! Where do I sign up? We can’t keep just talking about it. By the way, why do you think the Trans Pacific Partnership (look it up in Google), and other laws and agreements being made in our countries (I’m talking America, Australia, England etc, not China or Syria here), has hidden in its agenda to seriously restrict internet access. If we can’t talk with one another, we can’t get together and protest their greed, lies and corruption. We are on the brink and the more we just mumble the more our power gets taken away from us. Your choice! at a high level, this could only be because the bank (a) is under some regulatory pressure to do so or (b) it’s based on their own initiative. If it’s the latter than then it could be due to one of many reasons – none of which will help your situation unfortunately. On the positive side, you can shop for the best rates to move your money to. Shop around a bit for the best offer rate. Even when you think you have the best rate advertised online, it’s still worth asking your branch manager as they may have discretionary rates over and above the advertised. I’d go for the global local banks – the HSBC’s, Citi’s of this world to ensure that you won’t be hit with this problem again (well, never say never but they would be a better bet than your prior bank). The finding the new bank is not so much the problem, it’s the ‘Lack of Customer loyalty from the bank’ that enrages me, especially after 30 +years being a loyal customer to them! Anyways, i’m sure i will be happier with the outcome.